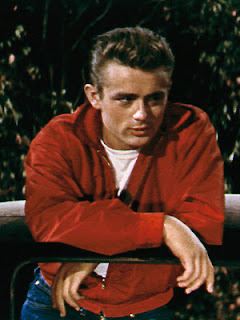 Rebel Without A Cause is one of the earliest serious teenage dramas, an examination of the seemingly insurmountable agony faced by young people in the face of clueless parents. It is also a gripping film, tightly directed by Nicholas Ray, who extracts enthralling, haunting, and career-defining performances from James Dean, Natalie Wood and Sal Mineo. Jim (Dean), Judy (Wood), and John, nicknamed Plato (Mineo) are deeply troubled Los Angeles teenagers: all three are suffering from severe conflicts with their parents. Jim's Dad is spineless, and his mother domineering. Judy is getting no affection and a lot of verbal abuse from her father, and she is hanging out with "the kids", the local bully gang and their leader Buzz. Plato's parents are simply not there: he does not really know anything about his father, and his mother recently abandoned him, leaving him in the care of housekeeper. After an evening when their lives cross at the local police juvenile office, Plato befriends Jim and sees in him a replacement father figure. Jim is attracted to Judy, but she pretends to be more interested in fitting in with the kids while flirting with Buzz. Jim is soon on the wrong side of the kids and agrees to challenge Buzz in a chicken run: an illegal car race towards a sheer cliff, with the first to bail labelled a chicken. As Judy, Plato, and the rest of the local teenagers watch, Buzz is accidentally trapped in his car and killed in the race. Judy and Jim warm up to each other, but the the bully boys want to silence Jim before he talks to the police about the illegal race. 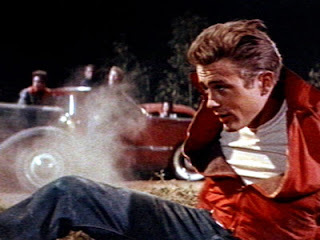 Rebel Without A Cause features a memorable and dominant James Dean performance. Showing remarkable vulnerability and anguish, his portrayal of Jim Stark as a tormented teenager crying out for guidance is riveting. The movie piles the pressure on Jim: he get no help from his Dad; the local bullies turn against him; all of a sudden Jim is thrust into the role of Plato's surrogate Dad; and his first, seemingly innocuous mis-step as a father figure results in a calamity. The film at least offers some hope that with a woman believing in him, things could get better. James Dean at 24 years old, Natalie Wood at 17 and Sal Mineo at 16 dominate Rebel Without A Cause, and enshrine their screen personas: Dean as the cool but troubled soul; Wood as the innocent but dangerous girl, and Mineo as the mis-fit. Their performances shine through the film, and into legend. In one of movie history's most cruel twists, all three suffered unexpected and cruel deaths. Dean perished in a head-on car crash later in 1955, the same year that Rebel was released, and just three films into his career. Mineo was murdered in a 1976 random stabbing. Wood accidentally drowned in 1981, after falling overboard from a yacht. Rebel Without A Cause draws a straight, bold line between failed parenting, specifically failed fatherhood, and troubled teenagers. The film is not subtle about Jim's emancipated Dad utterly failing to provide any guidance about becoming a man. Judy's Dad appears unable to deal with her as a woman rather than a child. And the void created by the absence of a Dad in Plato's life is the core of his journey into darkness. The title may claim a lack of cause; the content says otherwise: the cause of rebellion is easy to spot for those willing to confront it. All Ace Blog Movie Reviews are here.